Every industry has Key People of Influence. Their names come up in conversation…for all the right reasons. They attract opportunities…the right sort. They earn more money…and it isn’t a struggle. Key People of Influence also have more fun. They get invited on trips away, people buy them dinner, they are treated with respect and others listen when they speak. 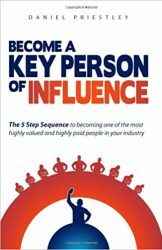 You may think it takes years, or even decades, to become a Key Person of Influence – as this book shows, nothing could be further from the truth! “Becoming a Key People of Influence” in your industry starts today!